When Can We Expect Rival Schools On PSN or XBLA? "Never"
That's a long time, never. 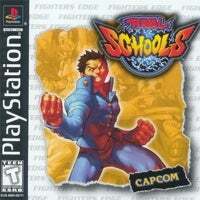 When asked when school yard fighting game Rival Schools would be appearing on the PlayStation Network, Capcom spokesperson Chris Svensson replied. "There are IP clearances and rights we no longer have (particularly pertaining to voicework/soundtrack I believe) so our IP management group has told us it can't be re-released," Svensson said. "I'm sorry as it's one of the ones I really wanted to see be put back up. "So if you still have that PS1 Rival Schools disc in your collection, it's unfortunately going to be the only way that gets played for the forseeable future." This does not apply only to the PSN, but all platforms, it seems. Bummer.